Violent, low-IQ psychopath Jericho Stewart (Kevin Costner) is implanted with the memories of a dead spy by the CIA, only to escape in London, where he uses his newly acquired skills to disable security systems, speak French (which be believes is Spanish), make waffles, and wreak havoc, all the while dodging bomb-throwing Spanish anarchists and looking for a bag full of money. 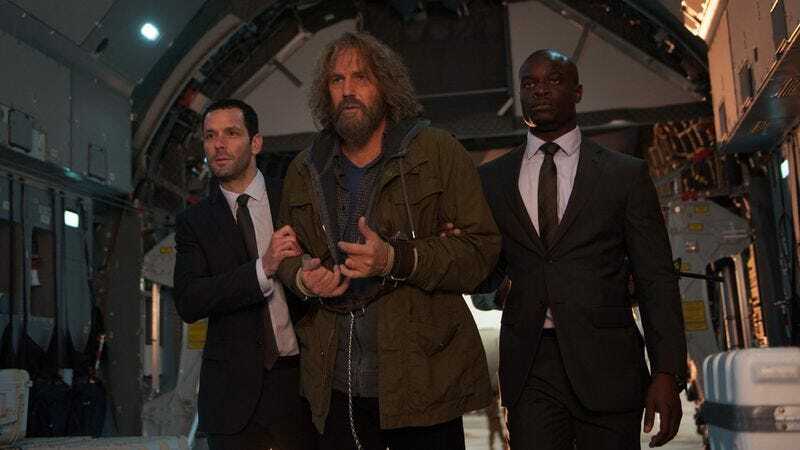 An unholy cross between Charles Manson and Charles Bronson, the middle-aged Jericho is actually the hero of Criminal, a high-concept thriller that teeters like a seesaw between deranged and dull. Maybe that’s what happens when a loony script by Douglas Cook and David Weisberg (The Rock) and an atypical Costner performance—with the actor’s mushy voice squeezed into guttural yelps and growls—are put in the hands of Ariel Vromen, director of the serial-killer biopic The Iceman and something of a specialist in making the lurid seem listless. 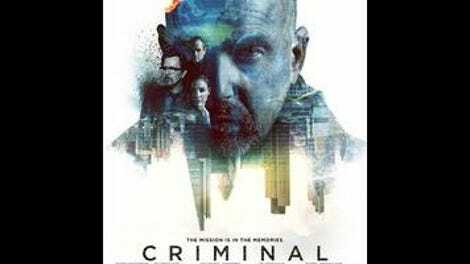 In attempting to set up its convoluted plot, Criminal presents, in close succession: a Piers Morgan cameo; a man being electrocuted with a cattle prod stuck in his mouth; Tommy Lee Jones inventing a mind-swapping technology in a wood-paneled office full of caged mice; and a bearded, barking Costner circling his cell in a dog collar while prison guards try to shoot him with tranquilizer darts. A childhood frontal lobe injury has robbed Costner’s Jericho of impulse control and moral sense; his damaged brain makes him an ideal host for the memories of CIA operative Bill Pope (Ryan Reynolds, in his second mind-swap thriller in a year, after Self/less), killed while attempting to meet up with a Dutch hacker (Michael Pitt with an awful accent) who always introduces himself by saying, “My cyber-name is ‘The Dutchman.’” Also involved are nuclear launch codes, a dastardly Spaniard, $10 million in cash, a library book, and “the Russians”—a veritable harvest of MacGuffins. After CIA station chief Quaker Wells (Gary Oldman) decides that several minutes of yelling at a man in a hospital bed are enough to figure out that the procedure didn’t work, Jericho is stuffed into a black car for disposal. Suffice it to say that the procedure does in fact work, but that Criminal is one of those films where all of the characters need to make piss-poor decisions in order to keep things moving. (Everyone here seems to have impulse control issues.) For long stretches, it skates by on the black comedy and giddy amorality of its plotting: Jericho beats a boiler repairman with a water cooler in front of an audience of stunned falafel-stand customers, strong-arms a librarian into telling him where he can find George Orwell, and uses Pope’s memories to get into his townhouse, tie up his grieving widow (Gal Gadot), and take the silverware. He also murders people, often gruesomely. The last third of the film skews toward sentimental goop, as Jericho discovers that all of his cool new spy know-how also comes with Pope’s sense of right and wrong and his memories of domestic bliss. (This, in turn, signals a transition into a more conventional—and significantly less funny—Costner performance.) What it needs is a shot of the extreme to match that mood swing arc. What it gets instead is Vromen’s lackluster sense of the frame, where chases—of which there are many—become series of randomly chosen angles and no one seems to be shooting in any direction in particular. Perhaps it’s almost too perfect that the movie should suffer from a personality conflict of its own; too bad that it’s the uninspired direction and not the demented pulpiness that dominates in the end. A viewer might find themselves appreciating the movie’s craziness while wishing that it were more pervasive.